Hiya, back again, and this time with a card I'm much happier with. 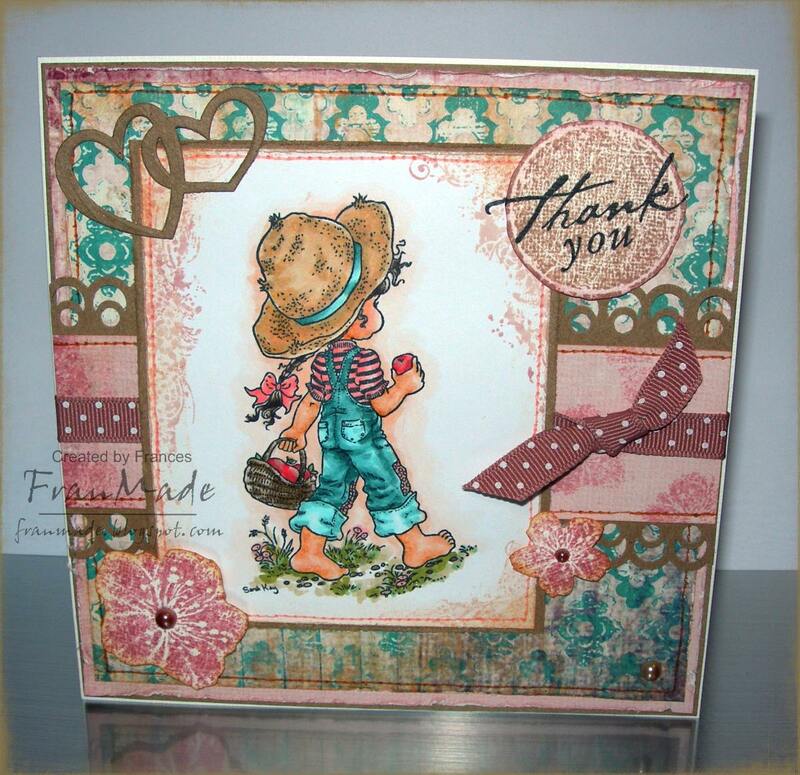 Thank you for the comments on my last card - it always surprises me how we can all view things sooo differently, as I really didn't like that one but some of you did - unless you were just being polite! (I wasn't fishing for compliments as I really wasn't happy with it but I like to blog all my cards, not just the ones I like). So on that basis, some of you may not like today's one as I do, alot! I wanted to use some of my neglected Sarah Kays so thought I'd ink this cutie up and then when I saw the Stampavie challenge this week was 'dots' I added a bit of spotty ribbon to my layout so that I could enter it there (plus there is dots in the pattern paper and the holes along the punched border could qualify as 'dots' too couldn't they?!). I'm also entering it into this week's PTW as their challenge is 'in stitches' and I've got faux stitching on mine. Hiya, what a scorcher of a week it's been. Hope you've all managed to stay cool and enjoyed your weekends (let's not mention the dismal football results!). Mine was spent working as usual but I did manage to have a little play with this cute LOTV image which has been sitting on my desk for an age. I thought I'd play along to the LOTV challenge for a change but I'm not very happy with the result - I was going for an aged look but that pink piece and the circle die I used doesn't look right and it all looks a bit amateurish to me but it's all stuck down now - oh well! At least I got to use my bargain cuttlebug hearts embossing folder which was nearly half price over at 'crafts U love'. I've been hankering after one for a while now (it an old duo combo set which I never got as I thought it was dots when it first came out and I already had a dot folder so never gave it a second look until I saw Debby use it and realised it was cute little embossed hearts but by then it was low down on my 'wishlist' due to the price but when I saw it reduced, how could I resist?!) The die cut 'hugs & kisses' phrase is also part of the set. I've stamped some flowers and hearts on the green card behind the image as it looked a bit plain and then I've edged all the papers with white ink. 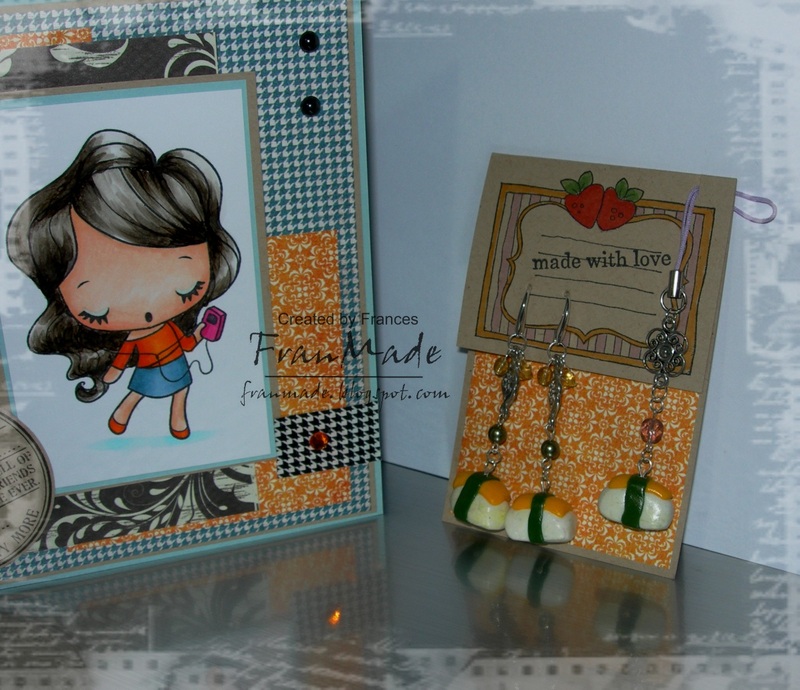 The more I look at this, the more I don't like it (my card that is, not the image - I love the image!) so we'll just leave it at that I think and move on! I've also not used my copics for this image, it was watercoloured with distress inks. Hello & a happy Thursday to you all. 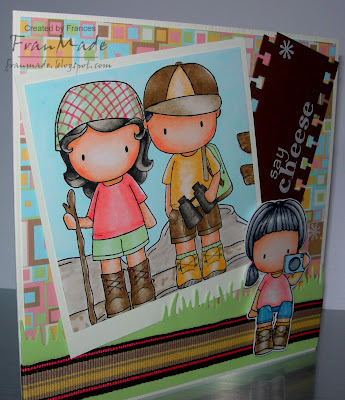 Time for my CCT card and this week's challenge is to have something recycled on your card. Now mine's a bit subtle, lets see if you can spot it . . .
Yup, that strip of grey ribbon across the top is from a piece of clothing (those hanging loops on the inside which I always cut off as they always end up hanging outside of your top when you don't realise it!). The funny monster is one of the new stamps from High Hopes which I had to get as I thought he'd be great for boy cards. I tried to give him a furry look when colouring him with my copics and have given him a shiny glossy accent nose which may not be that obvious from the photo. As with all my boy cards I have kept it simple and just used my MS border punches and some glittery adhesive dots for accents. This card is winging its way over to Hong Kong for my nephew's birthday. 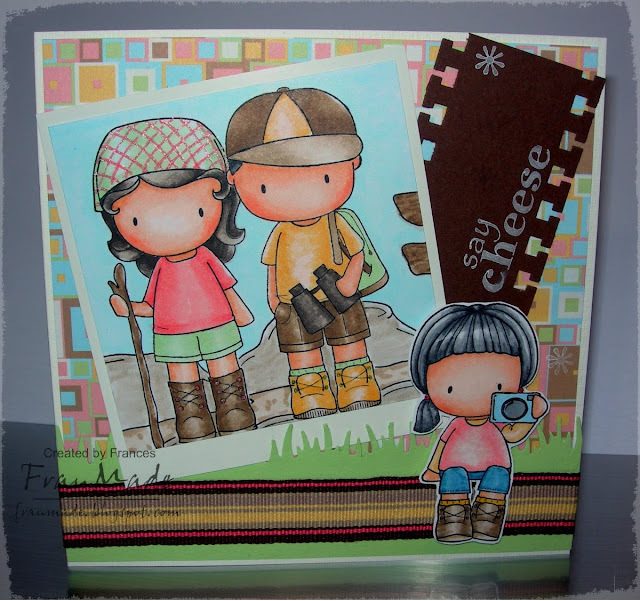 As I've used a High Hopes stamp I'm going to enter it into their 'anything goes' challenge this week too. That's all from me for now, thanks for dropping by. Others: blue glitter adhesive dots, ribbon cut from top! I wanted to make the couple look like it was photograph, so stamped them together along with the rock (loads of cute little accesory stamps in this set). The brown strip behind it is supposed to look like film negative. There is actually more writing stamped on the brown strip but I used a versafine watermark pad so it's not come out in the photo very well - it says 'picture perfect'. The cutie with the camera has been cut out and raised on foam pads, may be able to see that better below. I've also added glossy accents over the camera lens for a shiny glass finish. Everything else kept simple, just grass border punch and some coordinating ribbon. 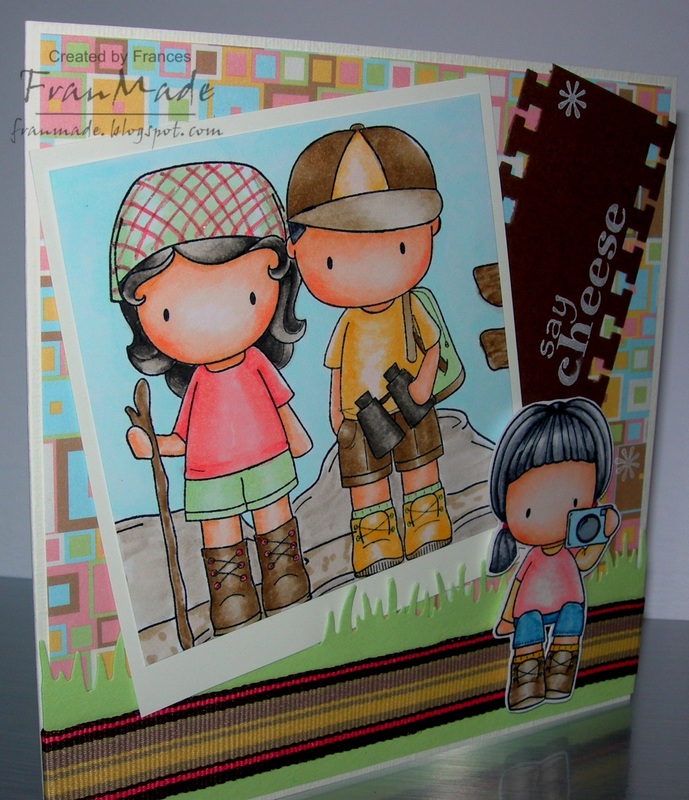 Thought this would make a cute card for someone going away on a trip/journey or holiday or for front of a mini photo album. CCT has a lovely sketch by Claudia this week but I'm afraid I've not done it much justice as I was in a rush, again! The cute Hanglar girl is one from my coloured up pile and I've just stamped some flourishes around her and put it all together before work yesterday so it's a bit lacking in the embellies and finishing touches (which I don't think matters too much when there's such a cute image taking centre stage). The yellow crochet flower does match the colours in the image/paper but it doesn't look it in the photo. Hello again. 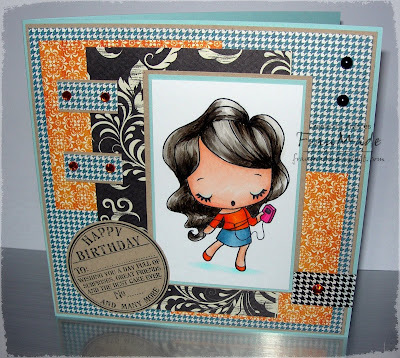 It's CCT time again and this week's challenge is to make a card that's anything but a square. I doodled on a 7"x5" piece of paper to make my ice cream template until I was happy with it (I just used the cone in the image as my guide to what it should look like). Then I just cut that out as my template and made my ice cream card as follows; 1. folded brown card and cut out whole ice cream template to create my base, (the fold is along the top). 2. 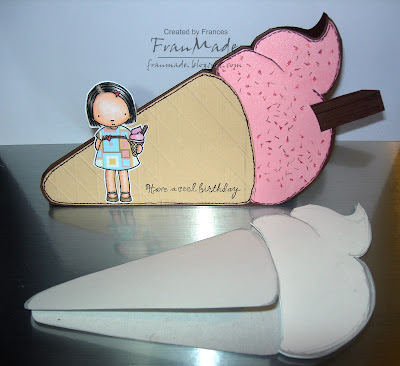 Traced the ice cream part onto pink card (pearlescent so nice and shimmery) and cut that out slightly smaller. 3.Traced the cone part onto beige card, cut that out slightly smaller then embossed lines onto it to give it the wafer look. 4. cut brown strip of card to create the flake and cut slit in the pink card to slot it in. 5. Assembled as shown and added faux stitching, the sprinkles and sentiment then finally the cute PI girl. 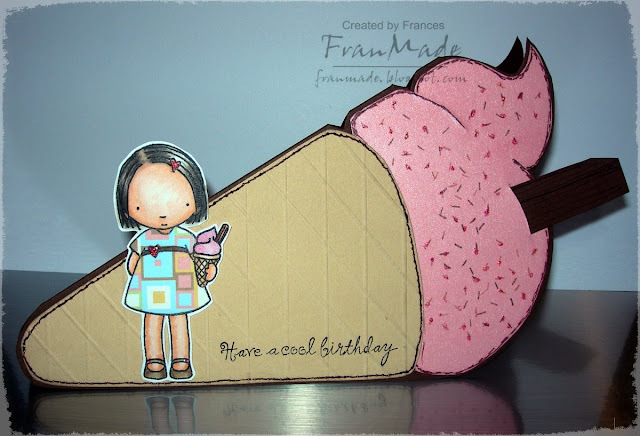 Shall leave you with another photo of my card with the various templates I cut out to use. The flake bit slides in and out so that it fits into a 5x7 envelope. Hello! Today's post is a card that's taken over a week to come together! Obviously my mojo got the pox too as I've just not been feeling too crafty lately. Luckily I think it's slowly coming back as I'm pretty much back to normal now (although still got lots of ugly scabs and a few scars which only time will tell whether they will go completely or not). Anyway back to the card. I've been colouring images at work when it's not busy so am slowly building up a little pile which are ready for me to make into cards. However, this has proven more difficult to me as I normally select papers and images together and then colour to match. Trying to find papers and a layout I was happy with for this cute Tilda proved to be more of a challenge! I was just about to give up as was getting bored at looking at her sitting on my desk, all cut out in her oval but not liking any layout I tried, until finally yesterday I was determined to finish it and the 'Just Magnolia' challenge was just the little nudge I needed to help it all come together. Their monthly challenge this week is to try lace pleating which I have done using the yellow organza ribbon, which you can see better on this 2nd photo (click on either for closer view). I just handstitched over the top of mine as I wanted the lilac contrast over the top. Tools:Oval Nesties, MS border punch (can never remember the right names - got too many of them LOL), MS & EK leaf punches, needle for the hand stitching! 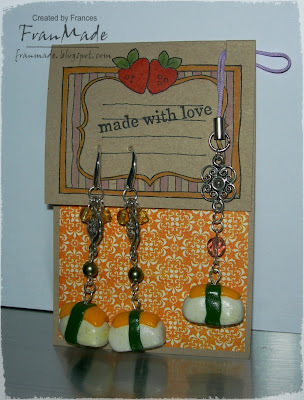 CCT~ Black, Blue & Orange Birthday Wishes & a bit of Sushi! Hello! and another week has been and gone making it time for CCT again. Thank you for all the well wishes. I still can't quite believe I got chicken pox and although not bad physically, besides itching, it has to be one of the worst ones to test your patience! I'm starting to feel like myself finally but I'm still pretty much covered in spots, including ALL over my face and they have only just started to scab over now - Ugh, it's like waiting for paint to dry. In the meantime I've been hiding at home (I frighten myself when I look in the mirror!) and overdosing on trashy TV (my craft mojo must have got the pox too). Poor hubby's had to run the shop without me but even he realises I would only put people off their food if they saw me LOL. So, you'll have to forgive me for making another simple card this week as I wasn't really in the mood but needed to make a card for my niece who's 17 today (god, how time flies). This image just reminded me of her with her Ipod wherever she goes and luckily I'd already coloured most of it last week so just coloured her clothes to match the papers which I chose to meet this week's CCT colour combo of black, blue & orange. Few gems & a sentiment and job done. Now, as I'm stuck at home I've not been able to go get a gift so I thought I'd make her a little jewellary gift (along with some cash which always goes down well, right?!). 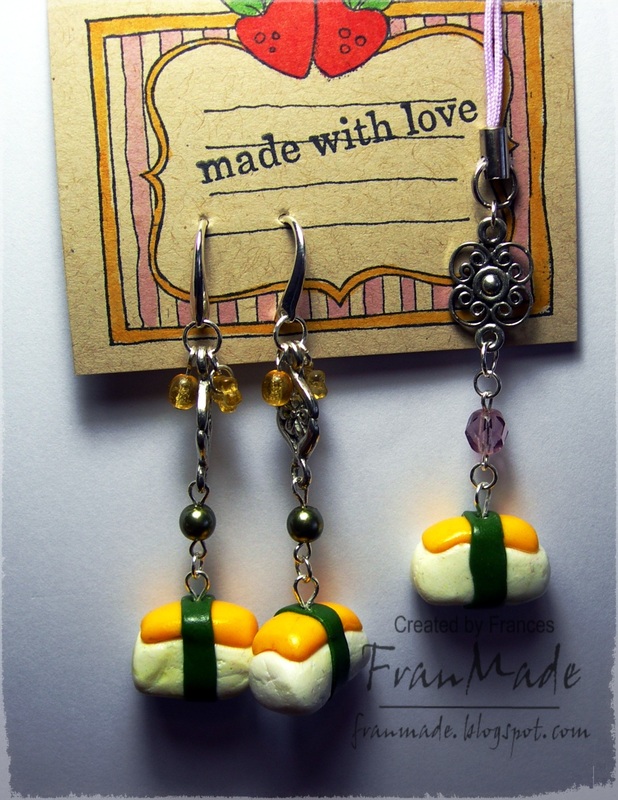 She loves Sushi, especially the ones with egg on it so I made her some fun earrings and a matching phone charm too :) out of Fimo clay and then the rest was just findings and beads from my stash. The holder is just made out of scrap piece of kraft card and orange dp and some Magnolia stamps from last year's cooking collection. I shall leave you with a couple more shots of the earrings and charm, hope she likes them.